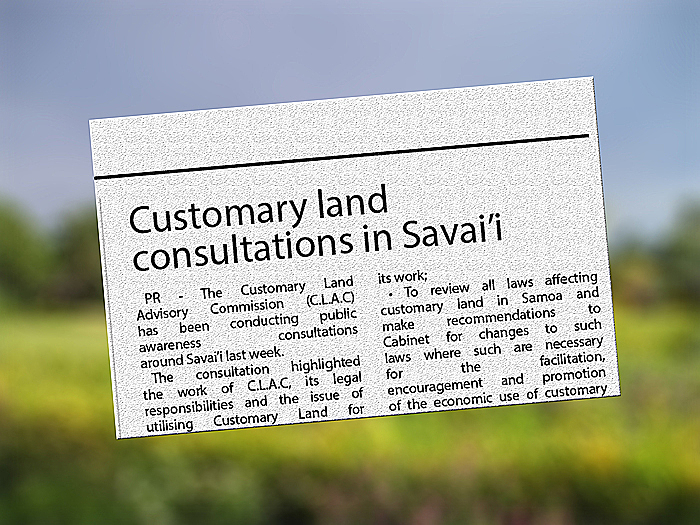 PR - The Customary Land Advisory Commission (C.L.A.C) has been conducting public awareness consultations around Savai’i last week. 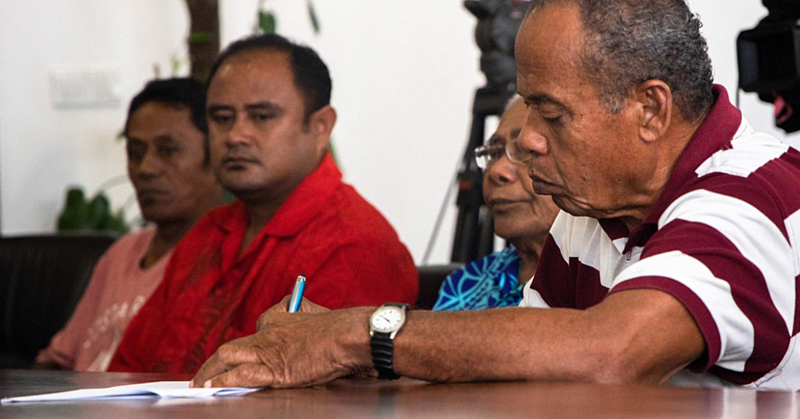 The consultation highlighted the work of C.L.A.C, its legal responsibilities and the issue of utilising Customary Land for economic returns that benefit, extended families, villages, Churches and the Country as a whole. These consultations utilise the recently launched “Consultation and Communications Strategy” funded by the Asian Development Bank. • To carry out any other function given to it under this Act or any other Act. 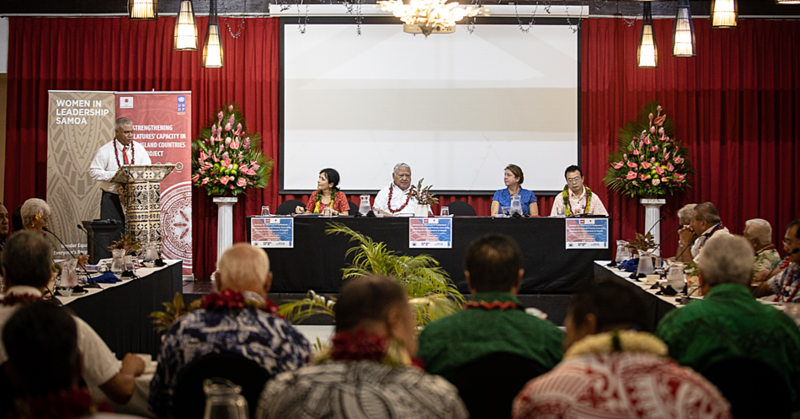 The Secretariat is led by Tuloa Fetufou Aiono and a supporting team of two seconded from the Ministry of Natural Resources and the Environment. Further assistance is provided by the Asian Development Bank via the Project Manager for the Technical Assistance. C.L.A.C was established under the recommendation of the Technical Assistance provided by the Asian Development Bank via the Greater Economic Use of Customary Land project. This project started in 2005 and will be completed in mid-2017. The fundamental aim of the project is to promote the economic use of customary land for the benefit of customary land owners. The leasing of Customary Land is one avenue for utilizing customary land for economic benefits. The leasing of Customary Land is not new. The foundation of the leasing process is provided for in the Alienation of Customary Land Act 1965. The benefits for customary land owners can be highlighted by the former Warwick Lease in Vavau. The customary land owners received about 87 thousand tala a year for the land alone. A certain percentage amounting to about 8 thousand a year was allocated to the village’s collective fund to be used for the maintenance of Churches, and schools buildings and other activities. The allocation of a percentage of the lease to the village allowed the by-in from the whole village for the project and not just the families whose land were being leased. Furthermore people were being employed as grounds people providing them with employment in the rural areas. 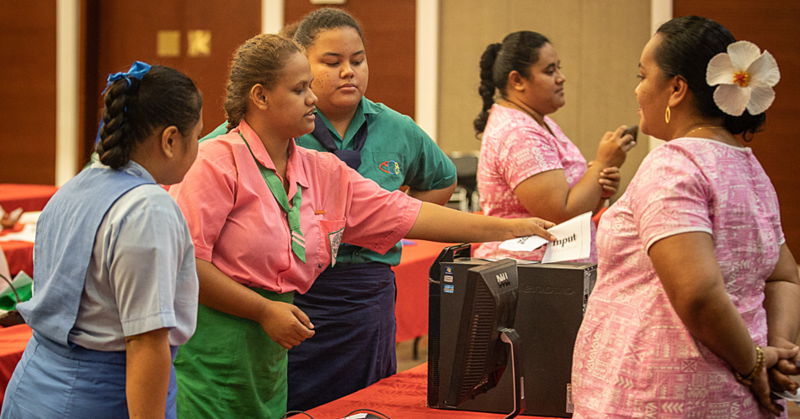 The next round of consultations for Upolu are provided below together with Radio outreach programs over the next two months.